How about that! I didn’t make an animal this time but a human. This actually started as my holiday fun project but because it took quite some effort to design this doll, I found it a waste to not publish a pattern for it. This is the result, meet Mini Me, just an example to make Mini You or any sturdy doll amigurumi. You probably wonder how this all started. Why on earth would I make a human? Well, I was browsing Instagram when I saw this terribly cute Doctor Who doll and I immediately got this idea of making myself as crochet doll so ‘I’ could pose with my crochet animals in pictures. Hah! How much fun would that be?! So, I started working on the doll and it was easier said than done. It took me quite some time to get everything as I wanted and of course my doll had to have a special feature too, I wanted a head that could turn. Long ago I made a doll with a rotatable head. It was very easy to make and the result was amazing. A head like that you make in one piece, the smallest part at the bottom you push into the actual head part, to create a cavity. It’s very effective and also gives your doll a nice chin and neck. When most of the doll was finished I realised what a special and sturdy looking doll it had become. Nothing like the ones I found on the internet. It would be such a waste to not write a pattern for it, but a ‘mini me’? I can’t expect you crafters wanting to make me! That is why the pattern is called ‘Mini human’. You can make yourself or just a doll with it by changing the colours and by doing different hairstyles. This crochet doll is made with Istex Lett Lopi, a 100% wool with a lot of fuzziness. It is standing 7 inch/ 18 cm hight. This is an easy to crochet pattern, creating the hairstyle takes the most time. 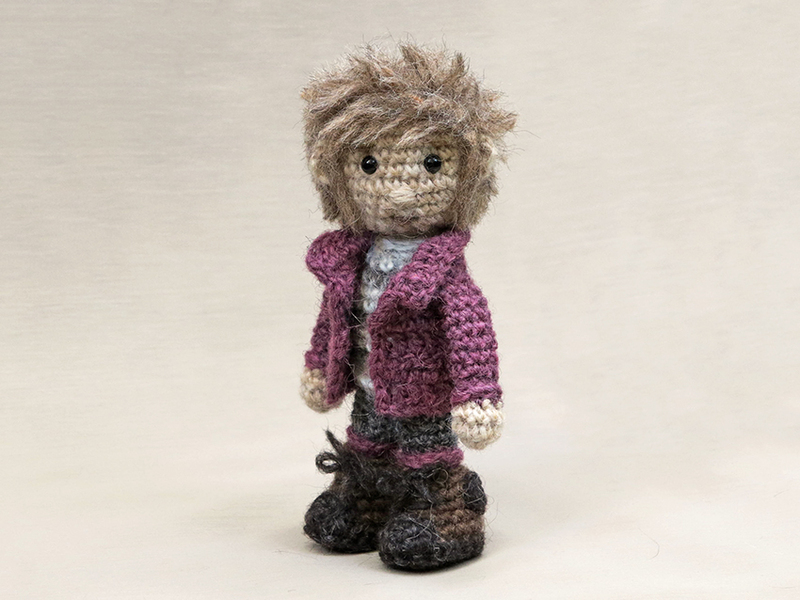 The pattern contains a clear description of how to crochet and assemble the doll, with extra images and example pictures at the bottom to help you get everything right. In the pattern you can also find what materials you need, the yarn colour numbers, in short, everything you need to know to make your own sturdy doll. All the additional information you need to know about this pattern you can find in the shop listings. You can buy this pattern in my shop at Craftsy and in my shop at Ravelry or order it here. This pattern has a one dollar release discount till Wednesday the 6th! And post scriptum, I LOVE the hair of my doll. Lopi is so suitable for creating wild hair and you don’t even need hair gel for it, it stays in shape all by itself. I wish I had Lopi hair. “You” are so cute! What an interesting idea. I love the hair, too! All your designs are very special. This is the most amazing self-portrait I’ve ever seen! She really IS you!